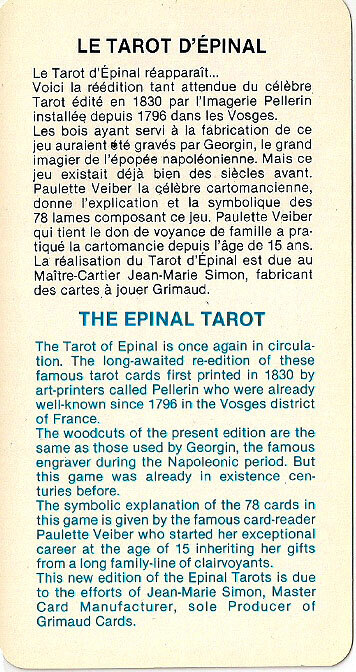 The Épinal tarot cards are believed to have been first published in 1830 by the art printers Pellerin & Cie, who were established in the Vosges district of France since 1796 producing card games, religious prints and other imagery, all inexpensively printed for popular distribution. The cards were in production until the 1870s. They have been reproduced more recently in several re-prints, including the edition shown here. 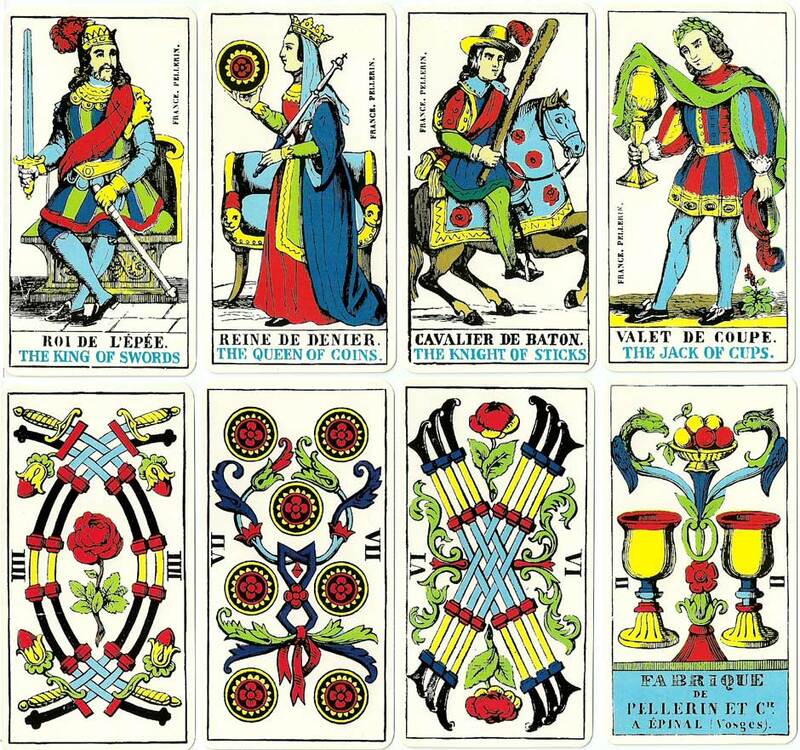 The woodcuts were produced by Francois Georgin (1801-1863), a famous engraver during the Napoleonic period, retaining the composition and general features of the Tarot de Marseille. As Épinal is located close to Besançon and Strasbourg, Georgin appears to have been inspired by packs in the Tarot de Besançon style which were already being produced locally and which include Juno and Jupiter on trumps nos II and V, instead of The Popess and The Pope, and who in the Roman pantheon were the emperor and empress of the gods. This feature originated during the earlier religious wars between Catholics and Protestants. The colours are bright and cheerful. 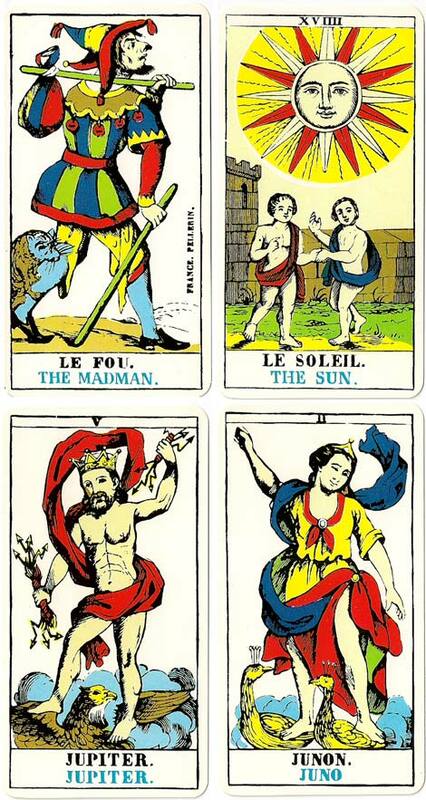 Some of the card titles and iconography depart from the traditional ones, such as Escamoteur instead of The Magician and Le Capucin instead of The Hermit. The Justice card shows a mirror and snake next to a book and Laws engraved in stone. 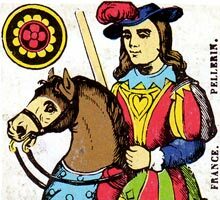 The minor arcana numeral cards are attractively designed with elegant sword hilts, graceful handles on the batons, decorated with foiliage and flowers. 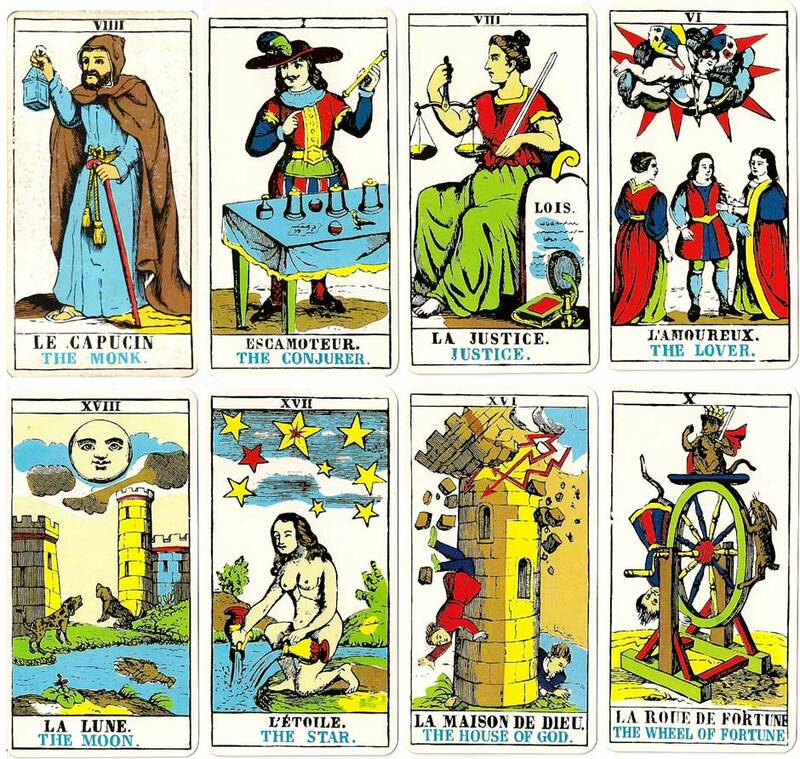 Above: “The Épinal Tarot”, 1830. Cards from the facsimile edition published by J .M. Simon, 1979. 78 cards plus a Consultant card, an information card and an explanation booklet written in English and French. According to the information card the woodcuts of this present edition are the same as those used by Francois Georgin (1801-1863), a famous engraver during the Napoleonic period. Images courtesy Rod Starling. Adam West-Watson wrote: "I have a very nice edition of it without the added English titles, published by Editions Arts et Lettres, 123 Grande-Rue, 54000 Nancy, from 1976. It does however credit J M Simon and Grimaud. The cards are identical except are just a tad shorter, have square corners and a very much more elegant back design."